Christmas is getting closer and dinner parties are more and more frequent. I think that most people will be saving their roast turkey dinner for the big day, but what if I told you that you could cook turkey in just over an hour and that it would be both beautiful and elegant. 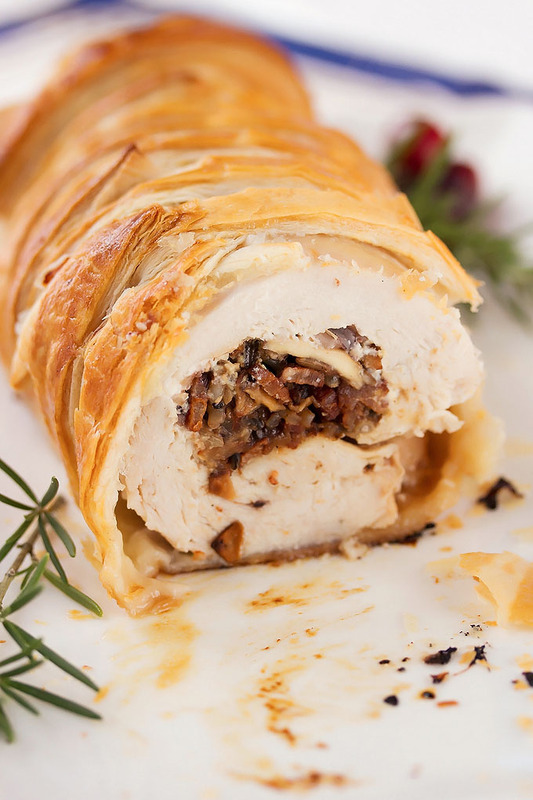 Would you serve turkey at your Christmas parties leading up to the big day? I think you would. Why the hell not? Especially after I tell you how easy this is to make! 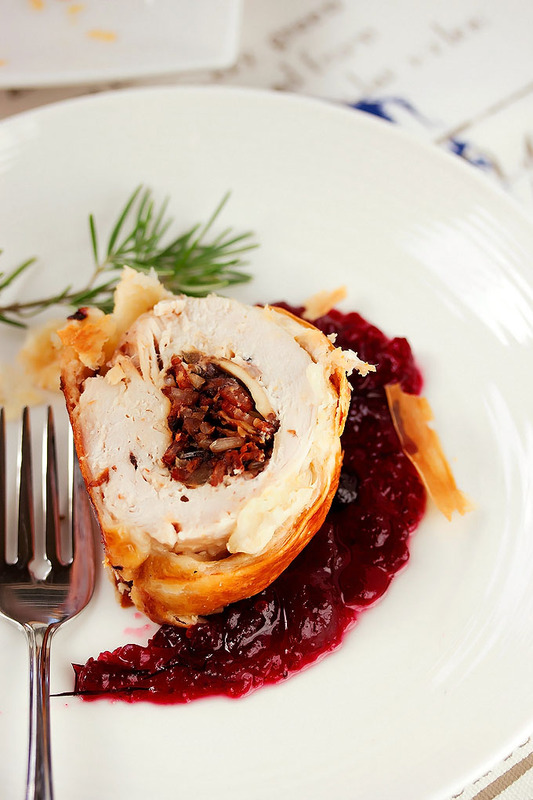 Turkey and cranberry is a fairly customary flavor combination during the holidays. But this turkey breast is anything but ordinary. 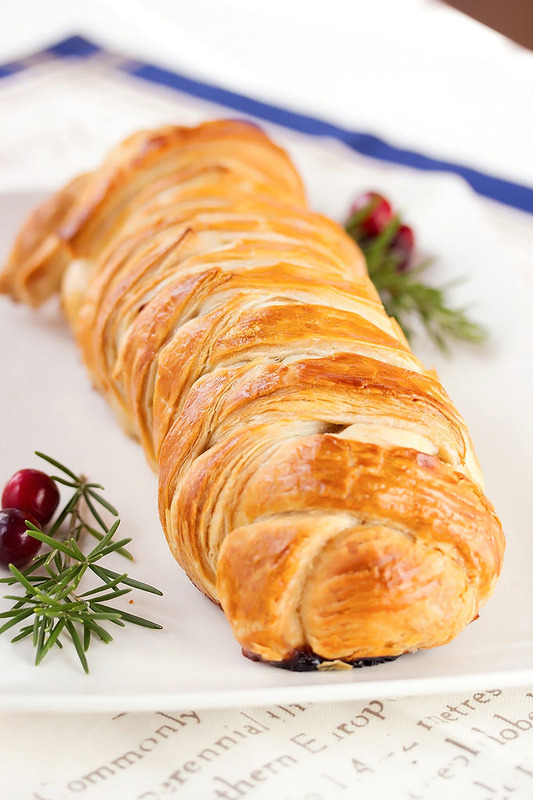 Its butterflied and stuffed with wild rice, creamy goat cheese, smokey bacon, earthy rosemary and sweet cranberry sauce, wrapped in buttery, flakey puff pastry and baked till beautifully golden on the outside, tender and juicy on the inside. I love a roast turkey, but for flavor, this beats it, hands down. This dish is SO much easier than a full on roast turkey and takes a fraction of the time. The hardest part is making sure that not to cut the pastry in one inch strips that are sliced too close to the center. You want the bottom of the pastry to come up half way before the strips start criss-crossing over the turkey breast. That way, all the juices don’t run out and pool in your pan and make the outside of the pastry soggy. This happened to us the first time. Soggy pastry is not awesome. The turkey was still delicious though! Isn’t it gorgeous? A totally impressive dish to serve this season. In a medium skillet over medium-high heat, heat olive oil. Add the onion and garlic; cook, stirring frequently, about 3 minutes. Stir in the rosemary, 1/4 teaspoon of the salt and 1/4 teaspoon of the pepper. Remove from heat; set aside to cool. Place the turkey breast inside a large zip lock bag. Pound until it’s nice and flat (about 3/4 – 1 inch thick). Sprinkle turkey with remaining salt and pepper. Spread the goat cheese down the center of the turkey. Add the onion and rosemary mixture, cranberry sauce, wild rice and bacon. 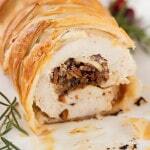 Roll up the turkey to enclose the filling as well as you can. Heat oven to 400°F. On parchment lined baking sheet, roll puff pastry to a 15 x 10 inch rectangle. 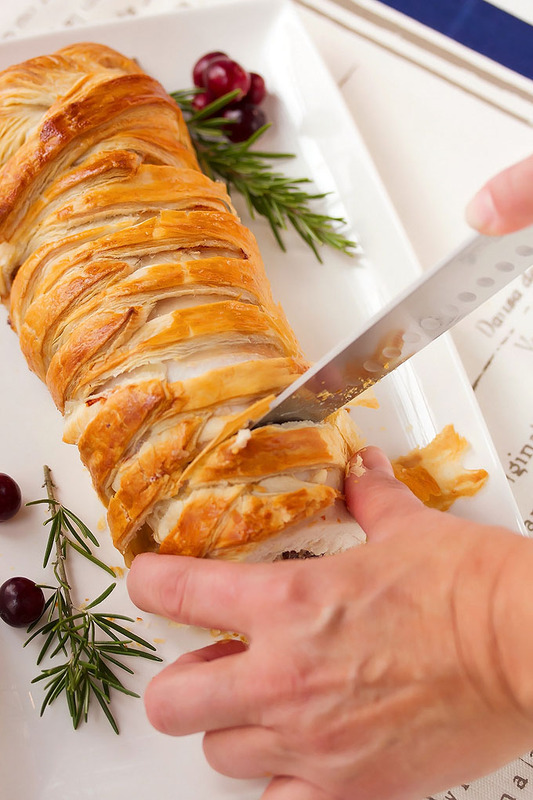 Place the stuffed turkey breast in the center of the puff pastry. With a sharp knife, cut horizontal slits (about 1 inch apart) on the edge of each side of the pastry dough. Fold each piece over the turkey breast and continue until the turkey breast is completely covered. Tuck the edges of the both sides in and pinch them well. Brush the puff pastry with the beaten egg. Place in the oven and cook for 70 minutes or until your meat thermometer reads 180 degrees. Serve with extra cranberry sauce on the side. Oh wow. This must be so fantastic tasting! It’s absolutely gorgeous. I’m a sucker for anything with puff pastry, or bacon!